The Eight Factors measures four basketball criteria along with four non-basketball criteria to take the measure of who will win each Sweet 16 game. Eight factors for the Elite Eight? It just feels right. In this installment: 7-seed Florida (25-10) vs. 3-seed Marquette (27-7). Here’s what I know about Gainesville, Florida: If you wander like half a mile out of town, there’s a 50 percent chance you’ll be kidnapped by a pair of shirtless brothers who speak an obscure English dialect based on grunts, spirited off to a swamp hideout on a souped-up fanboat, and forced to fight an alligator for their amusement. Here’s what I know about Marquette’s campus: The school is located in Milwaukee, which is also home to so much beer that their baseball team is named after people who make beer. And the famous sitcom Laverne & Shirley was set in Milwaukee. Guess where Laverne and Shirley worked? That’s right — a beer factory. Or is it called a brewery? Trick question. It’s called heaven. Billy Donovan? Well, he’s fine too, but I’ve never seen him dance. Let’s start with Buzz, the Texas native. He’s still a few months away from his 40th birthday, and he’s only in his fourth year at Marquette’s helm. In that time, he’s compiled an impressive 96-43 record and made the NCAA tournament every year. Last season was his first Sweet 16 appearance, but he’s duplicated the feat in 2012 and will be the favorite to advance to the Elite Eight after finishing second in the Big East. But as we know, Donovan’s résumé is just a bit more impressive. The highlights are two straight national championships in 2006 and 2007 with the Joakim Noah cadre, but his career has been remarkably consistent. In 16 years with the Gators, he’s run up a 385-157 record (.710), won four SEC regular-season championships and three tournament championships. There’s a perception that he’s fallen off lately, but after two straight NIT appearances in the wake of the title years, he’s taken his team back to the NCAAs three times in a row, reaching the Elite Eight last season before losing in overtime to Butler. So Donovan takes the point here. But I do hope, if Marquette wins, that Buzz Williams will dance to “Mellow Yellow” to mock Donovan. Because I don’t think Billy will get it, and I know Buzz is mad about saffron. I don’t know what it is about Florida schools, but they have the best colors. Maybe you’ll disagree, but I love Miami’s weird combo of orange and dark green, Florida’s orange and blue, and especially Florida State’s garnet and gold. As far as mascots, there’s nothing wrong with a golden eagle, but a gator? That’s the stuff of prehistoric nightmares. Chomp chomp. Marquette has a great argument for having the best 1-2 punch in Division I basketball. A losing argument, to Kentucky, but a good argument nonetheless. It starts with Jae Crowder, the Big East Player of the Year. He’s a 6-foot-6 senior averaging 17.6 points and 8.4 boards per game, with 2.5 steals thrown in for good measure. And what do you call it when you’ve got the conference POTY on your squad and he’s not even the leading scorer? That’s Golden Eagle basketball, starring Darius Johnson-Odom, the 6-foot-2 senior who averages 18.5 points and 2.8 assists while hitting from 3 at a 39 percent clip. (Along with Crowder, who shoots 35 percent, he’s one of just two deep threats on the roster.) As you might have guessed, the scoring drops off after that, with Davante Gardner and Vander Blue each contributing about nine points and five boards. Florida has the third most efficient offense in the country, and five players average double figures: Kenny Boynton (16.1), Bradley Beal (14.6), Erving Walker (12.1), Erik Murphy (10.5), and Patric Young (10.3). Boynton is an excellent 3-point shooter, averaging 41.5 percent from deep, while Walker, the point guard, has an exceptionally high assist rate and averages 4.6 per game. Beal, a 6-foot-3 freshman, plays bigger than his height in grabbing 6.7 boards per game, while the 6-foot-9 Young averages 6.4 boards and shoots 62 percent from the field. Murphy, at 6-foot-10, is the opposite of Beal — he plays smaller than his height, mostly staying around the perimeter, where he functions as the Gators’ deadliest shot, shooting 43 percent from 3. With two of the country’s best scorers and a strong ensemble, Marquette gets the edge here. Let me give you two takes on the Florida Gators. Take 1: This is a team from the relatively weak SEC that couldn’t beat Kentucky, the only true elite club in the conference, in three tries. It finished the year with three straight losses, to Kentucky, Vanderbilt, and Georgia, before squeaking by Alabama in the conference tournament and losing to Kentucky again. In the first round, Florida had the luxury of facing Virginia, possibly the worst team in the field of 68. In the second round, a crazy upset pitted the Gators against Norfolk State, who caught fire against Missouri but was well out of its league. Florida won both games by a lot, but it proves nothing. The Gators have been lucky as hell to get this far, and they’re due for a major reckoning. Take 2: Look at Kenpom’s statistical ratings. In his top 20, there are only three teams that received anything higher than a 5-seed, and two of them, Memphis and St. Louis, were mid-majors. The only other team, sitting at no. 13, is Florida. In other words, the Gators are a strong team that haven’t hit their stride yet, but most definitely belong in the Sweet 16. Which is true? We’ll find out tonight. As I noted before, Florida has the third most efficient offense in the country, with the eighth-highest effective field goal percentage, the 16th-lowest turnover rate, and a pretty solid offensive rebounding percentage, too. The only thing they don’t do is draw fouls, a reflection of their non-physical style. On defense, the Gators are fairly unexceptional in every category. Pop quiz: Off the top of your head, does Florida play fast or slow? I bet you thought fast, but the truth is the Gators are 220th in tempo. Not so for Marquette, a fluid, running team that loves to break and has the 13th-fastest adjusted tempo in Division I. And all this in the same state as the Wisconsin Badgers! That’s going to be the chief style contrast here. If the Golden Eagles can score on the run, they’ll overpower Florida, while a slower, more deliberate style benefits the Gators. 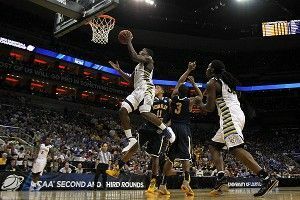 Defensively, Marquette excels at forcing turnovers, but has a tendency to give up offensive boards. As with the Cincinnati-Ohio State matchup, that could be a huge boon for Florida. Giving themselves second chances, using the whole shot clock, and frustrating Marquette’s quicker approach is the formula to containing Johnson-Odom and Crowder and winning the game. But Florida’s defense has a tendency to falter; in its last four losses (over seven games), the Gators have given up at least 74 points in each. Doesn’t exactly inspire confidence. Any momentum Florida has generated has been the false kind, against the likes of Virginia and Norfolk State. Before that, it was all struggle and strife. Mojo? Donovan is a smart coach, and he’s had a few days to formulate a game plan, but the odds are stacked against him. The Golden Eagles finished the season losing two of three, to Cincinnati and Louisville, but you’ll notice that both those teams are still in the Dance. Their tournament wins, against BYU and especially Murray State, have been far more impressive than anything Florida can claim. And Buzz’s dancing is all the mojo any fan could need. It should be pretty clear by now that despite the numbers, I think Florida is still a bit hollow at its core. Marquette can be stymied by slow offenses like Cincinnati, but all six of their losses have come against top-60 defenses. Four of them have come against the top 20. Florida is 74th, and they haven’t shown the defensive consistency against the best teams in the SEC to give me any faith that they’ll shut down Marquette’s speed game. Vegas favors the Golden Eagles by a point and a half, but even that could be giving Florida too much credit. Buzz and I know the truth, and we expect a blowout. Quite rightly.